The sky overhead at 10 p.m. from mid-northern latitudes on June 10. This week, as darkness descends, the stars of the Big Dipper are almost directly overhead. Next to Orion, the Dipper is probably the most impressive group of stars in our sky.Here we have seven bright stars, which give us quite a convincing tin dipper with its handle bent downwards.Yet we could easily imagine with our friends in England that it represents a plough, or we could liken it to a chariot or some other sort of wagon as people of many nations have done from the earliest times. The International Astronomical Union all officially approves the constellations shown on modern star atlases, but while constellations are official, asterisms are not.An asterism is often defined as a noteworthy or striking pattern of stars within a constellation, but that is not always the case.The Big Dipper is not a constellation itself, but an asterism, which is part of the larger constellation of Ursa Major, the Great Bear.What is remarkable is that these stars comprised a bear to widely separated early peoples - not only to Old World ancients but New World Native American tribes as well.The bear's nose is 3rd-magnitude Muscida, a corruption of the Latin musus, meaning muzzle. 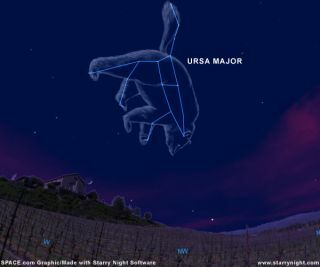 The bear's paws known to early Arabs as the "Leaps of the Gazelle" are marked by an almost equally spaced set of three pairs of stars.The Dipper's bowl is the torso. "Imagine that Jupiter, fearing to come too nigh unto her teeth, lay hold on her tail, and thereby drew her up into the heaven; so that she of herself being very weighty, and the distance from the earth to the heavens very great, there was great likelihood that her tail must stretch.Other reason know I none." Most people regard the Big Dipper as the leading star group in our hemisphere of the sky, and most astronomy books often use it as a jumping-off place for locating other stars and constellations; useful signboards to show the way to other features of the evening skies.It is probably safe to say that most stargazers and navigators regard the Big Dipper as the most important group of stars in the sky. For anyone in the latitude of New York or northward, this figure never goes below the horizon.It is by means of the Big Dipper that we can locate Polaris, the North Star: follow the direction of the Pointers, the two stars that form the front of the Dipper's bowl.Imagine a line drawn through the pointer stars and extended five times as far again beyond the Dipper's rim.This line leads to Polaris, the North Star. Occasionally, we make references in the sky to size in terms of degrees.We may say (as an example) that the Moon and a planet appear to be separated by, say, five degrees.But how large is that?You can actually use your fist to measure angular degrees on the sky.If you make a fist and hold it at arm's length, it measures roughly ten degrees.Thus, if you were to place the bottom of your fist on the horizon, the top part of your fist is about ten degrees up.Nine fists would take you to the overhead point, called the zenith.A distance of five degrees would be roughly equal to half a fist.Dubhe and Merak, the "pointer stars" in the bowl of the Big Dipper (they point to Polaris, the North Star) are separated by just over five degrees. The Moon has a diameter of just half a degree, although it seems to appear twice as large as this to our eyes. As an example, tonight, when you see the Big Dipper high in the sky be sure to look for an incredible illusion. Look at Dubhe and Merak and try envisioning how many full Moons would fit between them. But unbelievably, the answer is eleven! Second-magnitude Mizar is the middle star in the Dipper's handle (or the Bear's tail).Mizar has a fainter companion about one-fourth as bright known as Alcor. These two are not physically connected but are in the same line of sight as seen from the Earth.Consequently they seem inseparable and visually they almost are.Before the invention of eyeglasses, Alcor used to serve as an eye test.If you could see it your vision was considered normal. The Arabs called this pair "the horse and rider. "When Mizar and Alcor are viewed through a telescope the two appear brighter and farther apart.But that's not all.Mizar itself is separated into two stars close together.Back in 1722, a German mathematics professor, J.G. Liebknecht, was examining Mizar with a crude telescope and chanced upon a faint star between Mizar and Alcor.He believed that he had discovered a new planet and named it "Sidus Ludoviciana" or "Ludwig's Star" after his sovereign, the Landgrave Ludwig of Hessen-Darmstadt. His hopes were to flatter his local sovereign in hopes of being granted money. But the reaction from other astronomers was universally unfavorable, as they noted that the "planet" was merely a telescopic star.? The object never moved again, and Liebknecht disappeared in a hail of ridicule. Nonetheless, to this day, the star still retains the name that was bestowed upon it by Liebknecht when - for a few months anyway - it was thought to be a planet.